My number one concern today is the treats from Kim Jong-un of North Korea. My response may be different than others but what scares me the most is the possibility of preempted strike by our current administration. 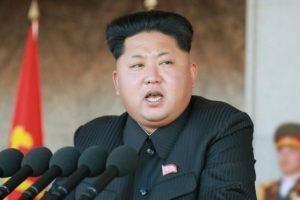 I believe Kim Jong-un is not suicidal, instead he may be one of the greatest poker players capable of extreme bluffing. However, if we were to take any type of preemptive strike it would be devastating to the city of Seoul, South Korea which sits just 35 miles away and would be the main target of North Koreas thousands of traditional artillary pieces aimed there way. In my opinion sanctions do not work and only go to aggravate the situation by increasing economic hardship on the people while creating additional hostility. Some of you may remember the movie “The Mouse that Roared” it’s about an impoverished backward nation which declares war on the United States, hoping to lose. North Korea’s nuclear program has certainly put the world on a high alert. It seems to me that louder one roars the more attention one gets. We must also remember in the middle of the DMZ are 30,000+ American troops, all of whom would be subject to any retaliation by the north. Diplomacy must always lead the way, there is no other reasonable answer and sanctions themselves don’t work. We need to open a direct dialog with Kim Jong-un and attempt to bring North Korea back to the International community. Instead of sanctions the possibility of trade might be a much more powerful tool to peace. I do not believe Kim Jung Un will ever give up his nuclear capability.